Neon Zebra doesn't teach abstract theories plucked from a textbook or gleaned in an artificial classroom setting. They share best lessons learned over the last 25 years in the most instructive arena of all -- the real world speaking stage. But don't take our word for it, see what leaders think. Even Lincoln would have been impressed! You’ll see a profound and positive impact the very next time you speak in public. Guaranteed applause at the end of your next talk. David Dempsey is THE Public Speaking Expert for no-nonsense executives. 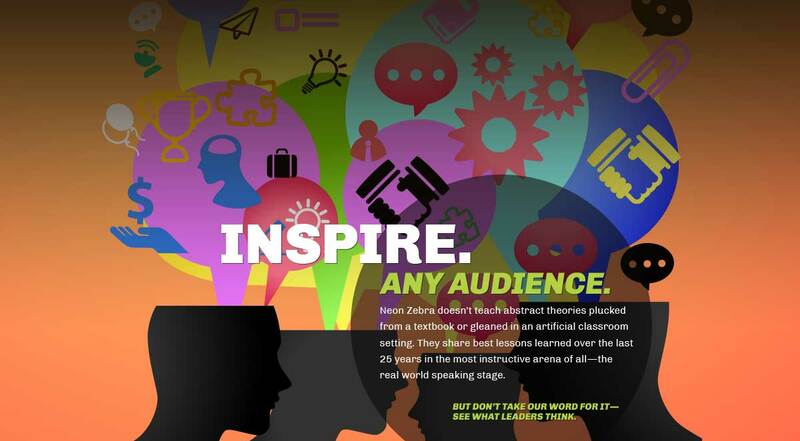 Neon Zebra’s recommendations for creating & delivering exceptional presentations produce results. David Dempsey’s battle-tested principles help us craft and deliver dynamic messages that truly make us stand out. David Dempsey gives lawyers a coherent game plan and detailed, actionable advice for rising above the clutter. Thomas Hale Boggs, Jr. Esq. Patton Boggs, LLP, Washington, D.C.
David Dempsey’s professional advice can take the anxiety and uncertainty out of any presentation. David Dempsey offers presentation wisdom and step-by-step advice to help you stop boring us to tears. Even Lincoln would have been impressed! Steve Forbes, President & CEO, Forbes Inc. 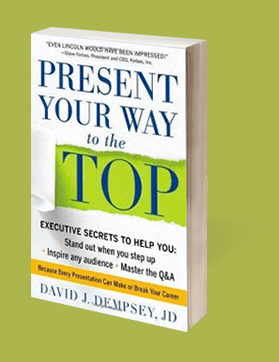 Present Your Way to the Top is full of practical insights that will help anyone deliver presentations that connect with audiences. This is not a book of abstract theories. David Dempsey gives us guidelines that have been tested and proven. It’s a great investment. United States Senator Bob Dole, Washington, D.C. If you know your next public speech will be drop dead wonderful, this may not be the book for you. But should you belong to the remaining 95% of the world, David Dempsey's Present Your Way to the Top is full of easy to absorb, readily read ideas that will stay with you. Guaranteed applause at the end of your next talk. Gerald Grinstein, CEO, Delta Air Lines, Inc.
From cover to cover, Present Your Way to the Top delivers on its promise to make anyone a more powerful and persuasive presenter. David Dempsey’s real world experiences and proven tips show you exactly how to get the bottom-line results you want from a business presentation. In my opinion, he is the Public Speaking Expert for no-nonsense executives. Peter Schwarzenbauer, President & CEO, Porsche Cars North America, Inc. Present Your Way to the Top is a great resource! This excellent book shows you how to speak in a way that will cause audience members to sit up and listen. It demonstrates how to have a meaningful heartfelt, conversation that connects with your audience, how to standout in today’s cluttered, speaker-filled world. Every speaker would benefit tremendously from reading this book and applying its principles. John R. Alm, Former CEO, Coca-Cola Enterprises, Inc.
With my busy schedule, I appreciate that David Dempsey has organized this book into quick, easy-to-read tactics for improving public speaking. I have found many informative and entertaining suggestions in Present Your Way to the Top. James C. Kennedy, Chairman & CEO, Cox Enterprises, Inc.
For several years, David and his team have coached and trained many senior executives of Siemens, including me, so I have a unique perspective. I know from first-hand experience that his recommendations for creating and delivering exceptional presentations outlined in Present Your Way to the Top work and most importantly, produce results. They will help any executive deliver more engaging, persuasive presentations. What really distinguishes his approach is that the advice he offers has been tested and proven in the most important arena of all: the real world. This is a treasure trove of great ideas. Scott Macdonald, Vice President, Siemens Industry, Inc.
Every law student and trial lawyer should be required to read this book. It is that practical. Senator Saxby Chambliss, Washington, D.C.
[Legally Speaking] is incredible, an inspiration to those who believe they know what they are doing, and a beacon for those who do not. I cannot think of any kind of lawyer who would not profit from it…. [Legally Speaking] is a great book,	 Michael D. Jones, Esq., Kirkland & Ellis, Washington, D.C. Legally Speaking is both entertaining and informative. I highly recommend it to everyone seeking to improve their skills as a communicator, a leader, and a lawyer. United States Senator Bob Dole, Washington, D.C.
Every lawyer could learn something helpful about public speaking from Legally Speaking, and most lawyers could learn a lot. David J. Dempsey presents useful, practical guidance on how to prepare for and deliver an effective presentation. Remarkably, this is the rare how-to book that is a pleasure to read, either all at once or in small, entertaining, easy-to-digest pieces. Charles A. Rothfeld, Esq., Mayer, Brown, Rowe & Maw, Washington, D.C.
David’s 40 Principles contain both lots of material that took me 40 years to figure out and other things I never did. This is quite a good book and should be useful…to virtually all advocates. Robert N. Sayler, Esq., Covington & Burling, Washington, D.C. 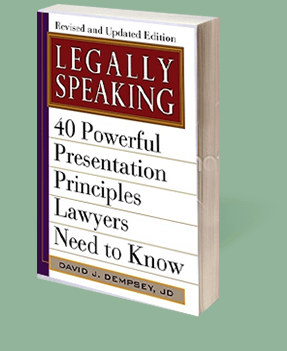 Legally Speaking is a good read for lawyers seeking to improve their communication skills. It provides a host of valuable tips and does so in a practical and highly entertaining manner. Richard E. Wiley, Esq., Wiley Rein & Fielding, LLP, Washington, D.C. In a world where we are increasingly overloaded with information and the amount of time to sort through it seems ever to diminish, the ability to connect with our audiences carries a premium. Mr. Dempsey gives lawyers a coherent game plan for rising above the din and clutter. His advice is detailed, practical and actionable. Thomas Hale Boggs Jr., Esq., Patton Boggs, LLP, Washington, D.C. Legally Speaking is incredible, a great book, an inspiration to those who believe they know what they are doing, and a beacon for those who do not.